Fancy trying something different when you have had your fix of skiing (is that ever possible) well just in case why don’t you give this a go its great fun and some awesome views along the way. 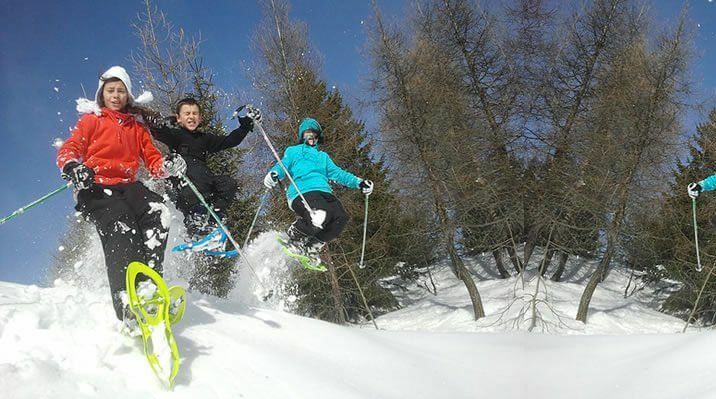 Half day snowshoeing excursion suitable for all the family or for solo travellers. Get to know the mountains at a steady pace while being guided by high mountain instructors. Every trail is an adventure and they offer various trails and hikes around Morzine. Their qualified instructors will safely guide you to awesome sites and will share their knowledge about the area, the fauna and flora along the way. Your instructor will lead the way whilst you enjoy the landscapes. It’s a refreshing way to escape and to forget about your everyday hustle and bustle. Go off the beaten track in Avoriaz, away from the pistes and discover remote parts of the mountain the forests, search for animal tracks and look for Chamois. This activity is also available in the evenings with a mountain meal in a refuge or an igloo. 2018 / 2019 season price is from €25 – get in touch for more details.